From Mississippi River catfishing in the west to the trout streams in the east, Tennessee offers an array of fishing outlets for almost anyone to take advantage of. There are a few tried and true lakes such as Reelfoot Lake and Kentucky Lake that traditionally boast an excellent crappie fishery year after year. As far as the state's largemouth population is concerned, bass can be found in any of the typical mainstream Tennessee River reservoirs throughout the state, including Kentucky and Chickamauga Lakes. For smallies, highland lakes such as South Holston, Norris, Dale Hollow, and Watauga are best. Many of the lakes in the eastern part of the state feature excellent catch and release sized fish. Most of these smallmouth lakes have an 18 inch minimum length limit and while those fish numbers under the limit are increasing somewhat, the trophy-sized 18-inch and above are staying steady. Dale Hollow, however, is still the premier smallmouth lake in the state, with its 16 to 21-inch slot and a reputation for housing trophy-sized smallmouth. Catfish anglers in Tennessee have the best of all worlds: big rivers small lakes, small rivers, and reservoirs. Big fish bodies of water including Watts Bar, Cheatham, Barkley, the Mississippi River, Kentucky Lake, and Chickamauga are excellent throughout the spring and summer, while small lakes such as the Agency's Family Fishing lakes in middle and west Tennessee offer year round catfish fishing. Sauger fishermen can have success below Pickwick and Cordell Hull dams during the winter months, while walleye can be caught in good numbers in Norris, Center Hill, Tims Ford, and Tellico lakes in the spring. Trophy striped bass and Cherokee bass (hybrid striped bass) can be found in lakes such as Norris, Cherokee, Watts Bar, and Tims Ford in the spring and winter months. For trout anglers, the brookies in the Smokies and in the Cherokee National Forest offer a challenging fishing experience. World class rainbow and brown trout fishing can be found in tail waters below South Holston, Wilbur (Watauga), Norris (Clinch), and Center Hill (Caney Fork) dams. Center Hill Lake 24"x36" One-sided. Scale 1:35,000 3-D Lake Structure. Waterproof and Tear Resistant! GPS Compatible, Mairina Listings, Lake Structure, Road Network. Extending 64 miles upstream and covering an area of 18,220 square acres, Center Hill Lake has a storage capacity of 762,000 acre feet of water. The lake has aproximately 415 miles of shoreline, with a maximum depth of 190 feet. The water shed area for the lake is 2,174 square miles. Visibility in the lake ranges from 3.5 feet to 6 feet in the summer months. The TWRA and local anglers have placed many fish attractors and brush piles throughout the lake, which adds to making Center Hill Lake an excellent lake for fishing. Abundant in the lake are smallmouth bass, largemouth bass, striped bass (white bass), catfish, bluegill, and walleye. The lake also offers brown trout, rainbow trout, paddlefish, spotted bass, and three types of crappie. The Tennessee state record spotted bass was caught here in 1989 weighing 5 lbs. 8 oz. Dale Hollow Lake, TN., Scale 1:48,000. One-sided. 24"x36". Waterproof and tear resistant! Dale Hollow Lake is a picturesque lake located north of interstate 40 on the Kentucky / Tennessee border. Tthe lake is in part of three counties in Tennessee, Clay , Overton, and Pickett and two counties in Kentucky, Clinton and Cumberland. The largest part of the 52,542 acres ( 27,700 water and 24,842 land) is located in Clay County Tennessee. Fishing is prime in this deep cold water lake that holds the record catch of a small mouth bass or if you prefer other activities such as swimming, water skiing, boating, and deep water skin diving. Lake Watauga 23"x35" One-sided. Scale 1:24,000 Waterproof and Tear Resistant! GPS Compatible, Mairina Listings, Lake Structure, Road Network and More. Watuaga (Native American word for 'beautiful waters') Lake is located east of Elizabethton and southwest of Mountain City.Watuaga lake borders the Cherokee National Forest at the southwestern end of Johnson County and flanked by the Appalachian Mountains. The lake is 19 miles long with 106 miles of shoreline. Roan Creek and Watauga River feed into the lake. At 1960 feet above sea level Watauga Lake is the highest lake in the Tennessee Valley Authority system. Watauga Lake is the third cleanest lake in America. Thirteen species of game fish including rainbow and brown trout, walleye, and smallmouth and largemouth bass inhabit the waters of the lake. Boone/South Holston Lakes 25"x38" One-sided. Scale 1:24,000 Waterproof and Tear Resistant! Boone Lake offers 130 miles of shoreline, 8 miles of which is island shoreline. At normal maximum pool, the reservoir contains 189,100 acre feet of water. The reservoir is 10,053 acres with a shoreline of 160 miles and 8 miles of island shoreline. South Holston Lake is on the South Fork Holston River and is surrounded by Sullivan County in Tennessee and Washington County in Virginia. Tims Ford Normandy and Woods Lakes 24"x36" Two-sided. Scale 1:24,000. Two-sided. Waterproof and Tear Resistant! GPS Compatible, Mairina Listings, Lake Structure, Road Network and More. Colorful 3D Lake Structure of Tims Ford, Normandy and Woods Lakes. The shoreline of Tims Ford Lake totals 246 miles, with five miles of that belonging to islands in the lake. The surface area is about 10,700 acres. Fishing will yield Largemouth Bass, Smallmouth Bass, Striped Bass, Walleye, Crappie, Catfish, Bluegill (Bream). Principal fish species in Normandy Lake include green sunfish, largemouth bass, longear sunfish, and bluegill. Woods Reservoir fishing include: Largemouth Bass, Smallmouth Bass, White Crappie, Walleye, Muskellunge, Blue Catfish, Channel Catfish, Flathead Catfish, Bluegill, Shellcracker (Redear sunfish), Longear Sunfish, Green Sunfish, Carp, Golden Redhorse. Tellico Lake 23"x35" Scale 1:32,000. One-sided. Waterproof and Tear Resistant! GPS Compatible, Mairina Listings, Lake Structure, Road Network and More. A colorful 3D lake structure representing of 373 miles of shoreline on 16,500 acres. Tellico Lake is about 30 miles southwest of Knoxville and offers a wide variety of recreational opportunities for visitors. Popular activities on Tellico Lake are fishing, boating, camping and swimming. Lake Chickamauga 24"x36" Two-sided. Scale 1:45,000 Waterproof and Tear Resistant! GPS Compatible, Mairina Listings, Lake Structure, Road Network and More. Chickamauga Dam is located 20 miles northeast of Chattanooga. Chickamauga Reservoir, with 810 miles of shoreline, has 35,400 square acres of surface area. Chickamauga got its name from a tribe of indians that broke away from the main body of the Cherokee Nation. Primary species of sport fish include white crappie, bluegill, white bass, channel and blue catfish, largemouth bass, and sauger. Lake Nickajack 24"x36" One-sided. Scale 1:45,000 Waterproof and Tear Resistant! GPS Compatible, Mairina Listings, Lake Structure, Road Network and More. Nestled in the Valley of the Tennessee River offering 215 miles of shoreline, 10,370 acres of surface area and is 46 miles long, extending up to Chickamauga Dam. The watershed (which is the area of land providing drainage to the reservoir) for Nickajack Lake is 21,900 square miles. Activities available on Nickajack Lake include: boating, fishing, waterskiing, jetskiing, swimming, camping, public parks, public access areas, picnic areas and more. On both sides of the river below Nickajack dam are fishing berms and a concrete fishing pier with foot bridges and wheelchair ramps. J. Percy Priest Reservoir 23"x35" One-sided. Scale 1:35,036 Waterproof and Tear Resistant! GPS Compatible, Mairina Listings, Lake Structure, Road Network and More. Located 9 miles southeast of Downtown Nashville off I 40. It is 15 miles upstream from Nashville and 6.8 miles from the Cumberland River. Percy Priest Lake is comprised of 14,200 surface acres of water at summer pool elevation (490 feet above mean sea level) with a 440-mile shoreline. Percy Priest reservoir stretches 42 miles upstream from the Cumberland River to the headwaters of the Stones River. The deepest point, which is close to the dam, is approximately 100 feet. The water is surrounded by 18,854 acres of public lands; 10,000 acres are devoted to wildlife management. Sportsman’s Connection is America’s leading publisher of regional fishing map guide books and lake map software. Sportsman's Connection offers high quality contour fishing maps with detailed insider fishing information for over 4,700 lakes in Illinois, Indiana, Iowa, Kentucky, Michigan, Minnesota, Missouri, New York, Ohio, South Dakota, Tennessee and Wisconsin with more states on the way! Three new 240 page books, covering all the best reservoirs, lakes and streams in Tennessee. 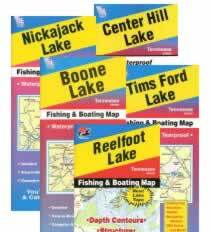 Detailed contour lake maps, stocking and sampling data, and excellent fishing tips, locations and strategies written by local outdoors writers for each reservoir and numerous streams.